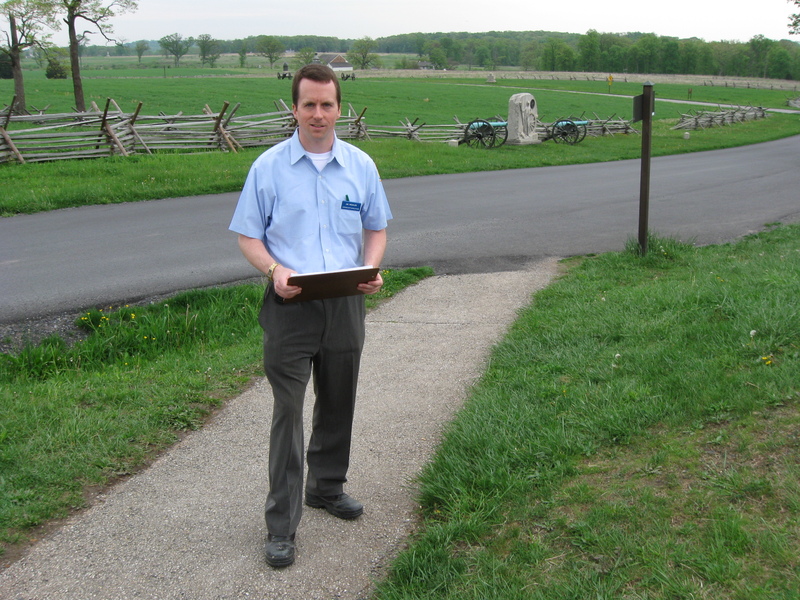 Gettysburg Licensed Battlefield Guide Jim Hessler, our host for the Sickles’ series, is standing on Little Round. He is getting a view that it is believed that General Sickles never had during the Battle of Gettysburg. This view was taken facing west at approximately 5:00 PM on Friday, May 8, 2009. One of the most interesting individuals at the Battle of Gettysburg was United States Major-General Daniel Sickles. His movement to a position forward of the Army of the Potomac’s battle line on July 2, 1863, depending on your point of view, either saved the Union Army, or almost led to its destruction. 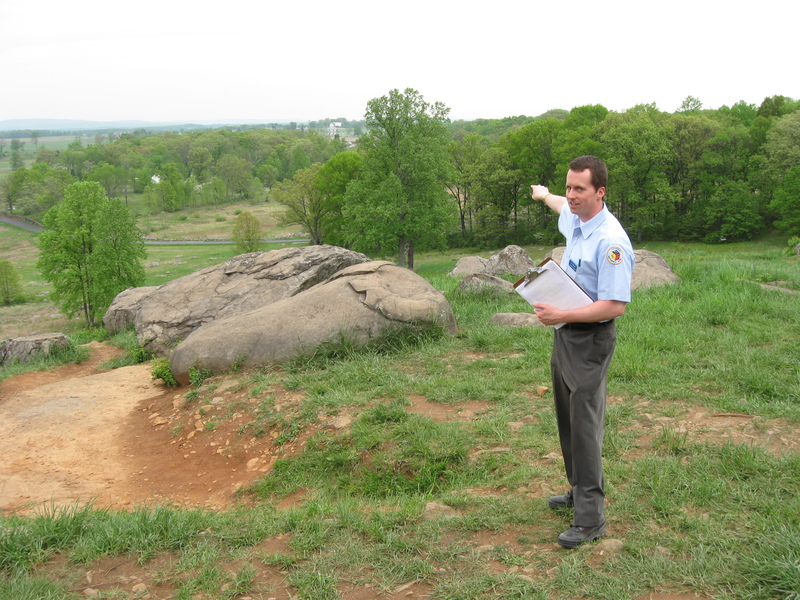 Gettysburg Licensed Battlefield Guide Jim Hessler has been guiding at Gettysburg since 2003. He is employed full-time with Bill Me Later/ PayPal and has been a Licensed Battlefield Guide since 2003. 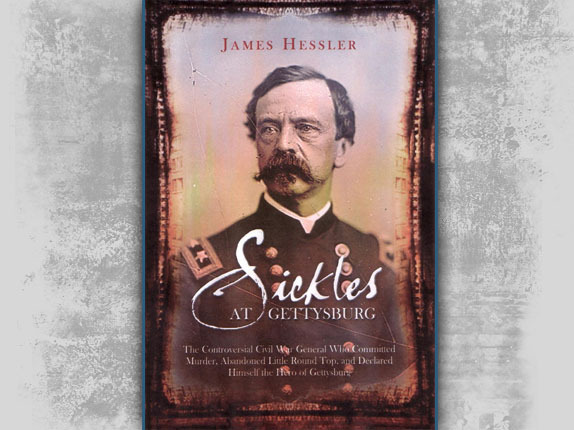 His book, Sickles at Gettysburg: The Controversial Civil War General Who Committed Murder, Abandoned Little Round Top, and Declared Himself the Hero of Gettysburg, will be published in June. He is a long-time Gettysburg and Little Bighorn enthusiast and also a speaker at Civil War Round Tables. He lives in Gettysburg with his wife and two children. In our first post on Sickles at Gettysburg we saw Sickles’ Corps’ position at Bridgeport, Maryland, Emmitsburg Maryland, and his arrival at the Gettysburg Battlefield. In our second post, we looked at Sickles’ Gettysburg position near Cemetery Ridge before he made his move west to the Emmitsburg Road. In today’s post, we look at Sickles’ movement to the line near the Peach Orchard and the Emmitsburg Road. This map shows the location of where our Sickles videos were produced. Videos #1-#5 were shown in our first Sickles video post. Videos #6-#7 were taken on Cemetery Ridge near the New York Auxiliary Monument. Video #8 was taken in the low ground near the George Weikert House. Video #9 was taken at Meade’s Headquarters (Leister House). Videos #s 10, 12, and 13 were taken in Sherfy’s Peach Orchard. Video #11 was taken on the north side of Little Round Top. This map was created facing north at approximately 9:00 PM on Friday, May 22, 2009. We’ll start today’s post on the east side of Sherfy’s Peace Orchard near the Emmitsburg Road. The Trostle Farm is in the background above and to the right of Jim Hessler. The New York Auxiliary Monument on Cemetery Ridge is above and to the left of the Trostle Barn. This view was taken facing northeast at approximately 5:00 PM on Friday, May 8, 2009. 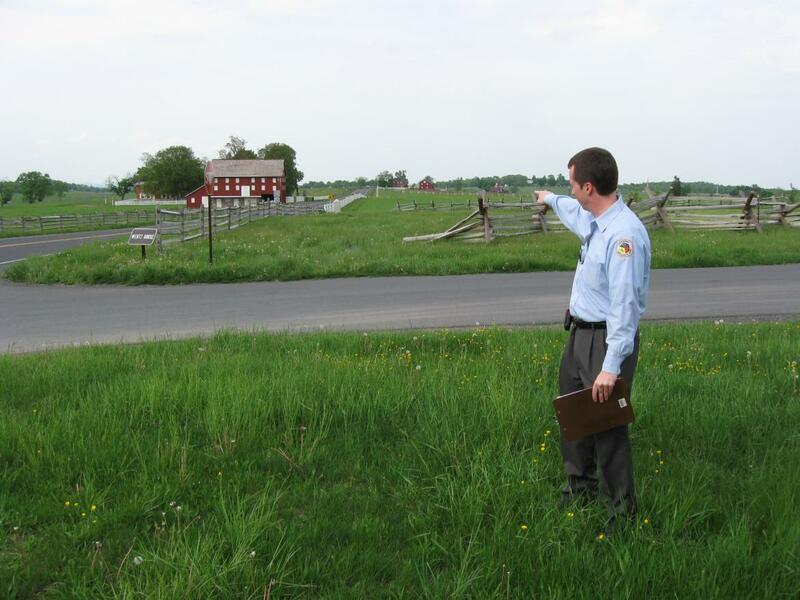 In Video #10 (Videos #1-9 were shown in the first two Sickles’ posts), Gettysburg Licensed Battlefield Guide Jim Hessler is standing on the east side of Sherfy’s Peach Orchard. He will move into the Peach Orchard and explain some of the reasons for Sickles move to his forward position. This view was taken facing northeast to west at approximately 5:00 PM on Friday, May 8, 2009. 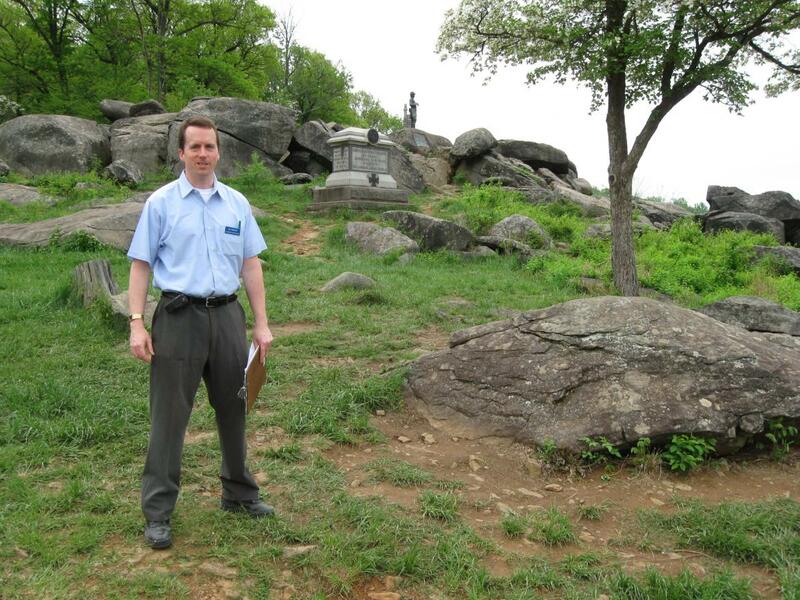 Gettysburg Licensed Battlefield Guide Jim Hessler is on the north slope of Little Round Top, pointing to where Major-General George Gordon Meade believes the Army of the Potomac’s line should be positioned. Cemetery Hill is marked by the light colored “old” Cyclorama building above the dome-shaped Pennsylvania Monument. 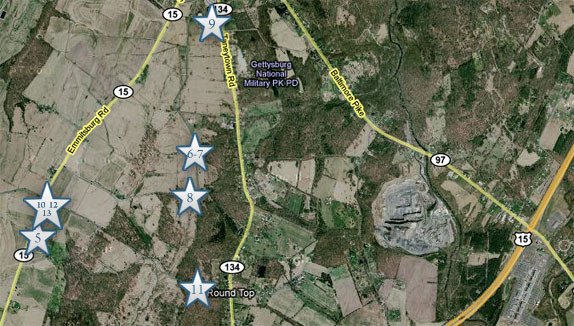 The line would stretch from the Pennsylvania Monument along Cemetery Ridge to Little Round Top (towards our position). This view was taken facing north at approximately 5:00 PM on Friday, May 8, 2009. 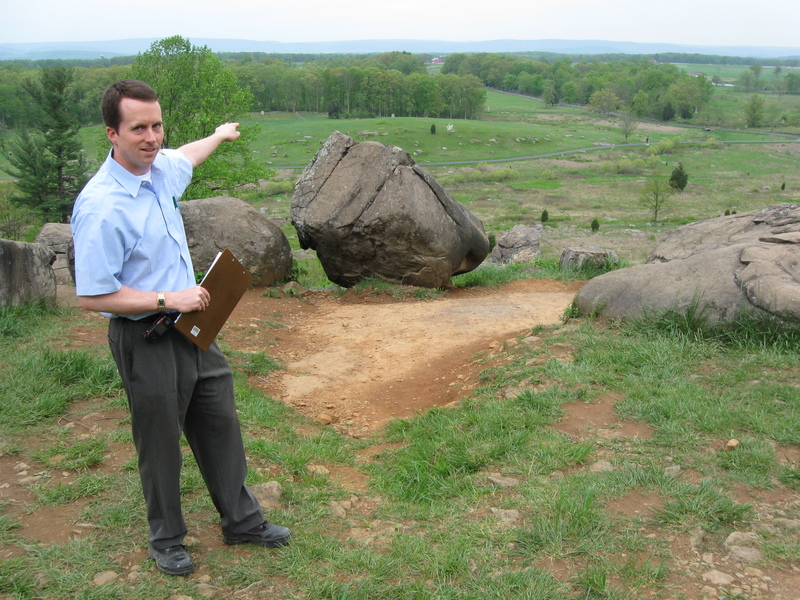 In Video #11 Jim Hessler is on the north slope of Little Round Top, pointing out the view that Major-General Daniel Sickles never had at Gettysburg, and how it might have made a difference in the position of his troops if he had this view. This view was taken facing north to west to south at approximately 5:00 PM on Friday, May 8, 2009. As Jim explained in Video #11, Major-General Gouverneur K. Warren believed more reinforcements should have been sent to Little Round Top instead of supporting Sickles forward line. The Warren Statue is at the top of Little Round Top holding binoculars. The monument to the 146th New York Infantry Regiment (Weed’s Brigade) is between Jim and the Warren Statue. This view was taken facing south at approximately 5:00 PM on Friday, May 8, 2009. Gettysburg Licensed Battlefield Guide Jim Hessler is standing in Sherfy’s Peach Orchard, and he is pointing to the line on the high ground near the Emmitsburg Road that Sickles wanted to take, and eventually would take on July 2, 1863. There are three farms still standing along the Emmitsburg Road that Sickles’ line followed. The Codori Farm is the red mass of buildings just to the left of his hand. The Klingel Farm is the mass of buildings in the middle of the three farms. The Joseph Sherfy Farm is the Farm on the left. Sickles new forward line would more or less follow the Emmitsburg Road south towards the Peach Orchard (towards the camera position). This view was taken facing east at approximately 5:00 PM on Friday, May 8, 2009. In Video #12 Jim Hessler is back at the Peach Orchard explaining the meeting that took place here between Major-General Sickles and Brigadier-General Henry Hunt, the Chief of Artillery of the Army of the Potomac. This meeting was at approximately 11:00 AM on July 2, 1863 and Sickles attempted to convince Hunt that this was a good position for artillery. We would like to thank National Park Service protection ranger Maria Brady for her help with the filming of this segment. This view was taken facing north to northeast to northwest to west to southeast at approximately 5:00 PM on Friday, May 8, 2009. In Video #13 Jim Hessler is in the Peach Orchard explaining the events that led Sickles to finally act and move his men forward towards the Emmitsburg Road and the Peach Orchard. This view was taken facing northwest to northeast to southeast at approximately 5:00 PM on Friday, May 8, 2009. 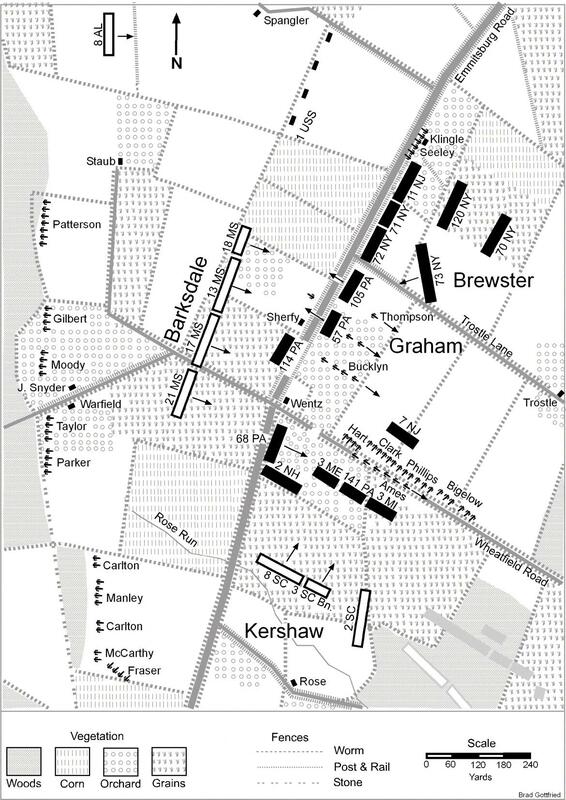 This map shows the line that Sickles’ Corps occupied in the area of Sherfy’s Peach Orchard early in the afternoon of July 2, 1863. This map was created by Brad Gottfried for Jim’s new book on Sickles, Sickles at Gettysburg: The Controversial Civil War General Who Committed Murder, Abandoned Little Round Top, and Declared Himself the Hero of Gettysburg. 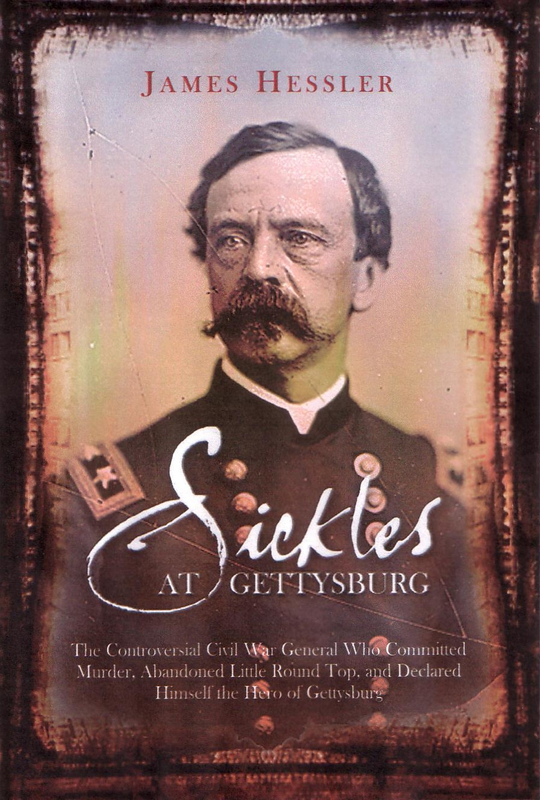 Here is the cover of Jim’s new book on Daniel Sickles. It is published by Savas Beattie LLC, and will be available in June, 2009. Click here for a link to an interview with Jim on their site. This cover was uploaded at approximately 5:00 PM on Tuesday, April 21, 2009.